Rising financial inclusion rates and increasing employment opportunities across the EU-28 countries are further augmenting the growth of Remittance Market in Europe. 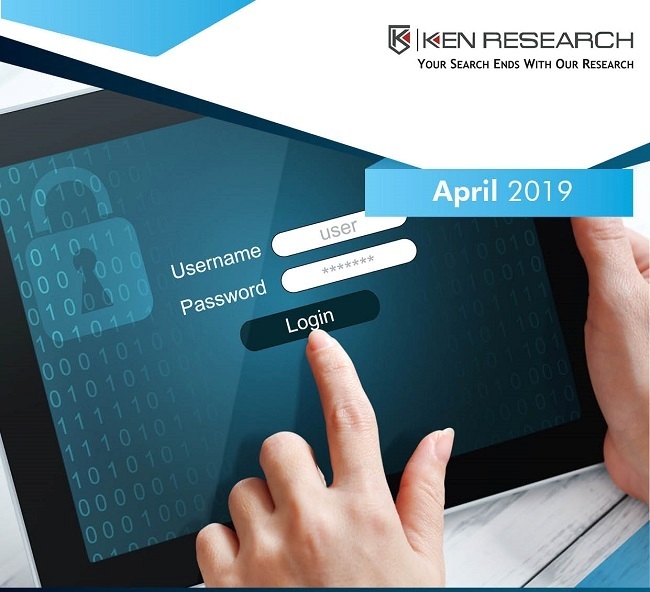 The report titled “Europe International Remittance Market Outlook to 2023 – By Inbound & Outbound Remittance, By Channels (Banks, MTOs, M-wallets and Others), By Inflow & Outflow Remittance Corridors, By Point of Contact (Branch Pick-up, Mobile Payment & Online Transactions, Prepaid Cards)” by Ken Research believe Europe remittance market has been growing at a swift rate due to rising migration rate, plethora of services offered by the remittance service providers, digitalization of channels, switching to formal channels from informal channels and increased tie-ups between remittance service providers in the region. The inbound remittance transaction value is expected to register a positive CAGR of close to 4% and close to 7% for the outbound remittance during the forecast period 2018-2023. 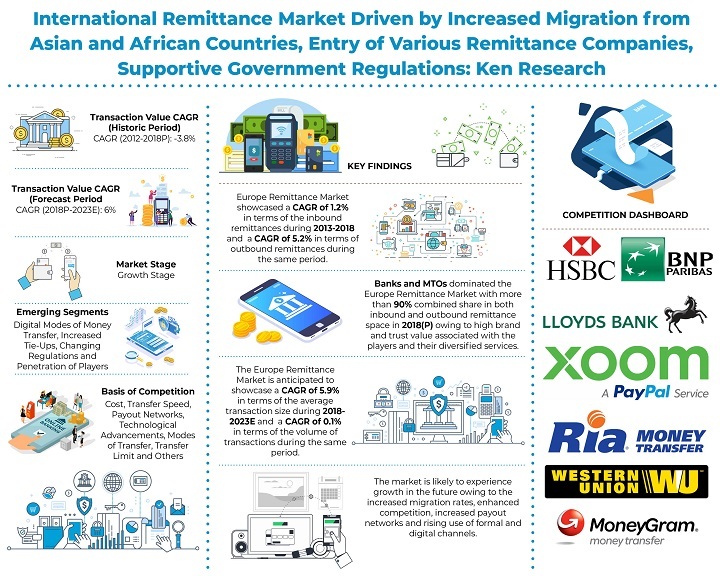 The market is further expected to be driven by new remittance service providers such as World Remit, Remitly, Revoult and others that are now entering the market. Rising Financial Inclusion Rates in the Region: The region has been witnessing an increased rate of financial inclusion over the past few years. Digital government payments of wages, pensions, and social benefits helped to drive the increase. Among those with an account, 17% opened their first one to receive government payments. The share of adults making or receiving digital payments rose from 46% in 2014 to 60% in 2018. This has influenced the remittance market of the region positively as it reduced the transfer of money through informal channels, that leaves the transaction unaccounted. Booming employment prospects: European Union faced a decline in the employment generation in the initial years after the global financial crisis. However, later on the region started recovering after 2013, when the euro crisis was finally contained. On an average, the rate of job growth is the same in the EU and the US, 2.7% in total in the years 2016 and 2017. Even Greece, a hard-hit euro-area country, is seeing a broad-based labor market recovery. In addition, Europe’s Innovation-Union initiative has been working on creation of jobs from the past few years. It strives for a 50% increase in R&D investments by 2020 claiming this could increase employment by 1.7% (or by 3.7 million jobs) by 2025. Shift from remittances through informal to formal channels: The lack of security posed in the use of informal channels and its high sensitivity to misuse for illegal purposes and low benefit offering to the economic development of the recipient country, has urged central banks and other authorities to encourage the use of formal remittance channels that are monitored under compliance. Additionally, such an initiative in the market has proved to be positive and has been compelling the users of informal channels to switch to formal remittance service providers in the region. In the recent years, the formal financial intermediaries, such as banks and MTOs, broadened their geographical presence in the region in both home and host country.